Radiohead frontman Thom Yorke says calls on the band to cancel Israel concert are a "waste of energy". Radiohead on Friday fired back at a campaign urging the band to scrap a show in Israel, calling the boycott effort divisive, patronizing and "an extraordinary waste of energy", AFP reports. The rock icons are scheduled to close a tour on July 19 in Tel Aviv. Recently, dozens of artists including notorious anti-Israel activist Roger Waters, sent a letter to Radiohead, urging the band to cancel its Tel Aviv concert. "Since Radiohead campaigns for freedom for the Tibetans, we're wondering why you'd turn down a request to stand up for another people under foreign occupation," said the letter. "In asking you not to perform in Israel, Palestinians have appealed to you to take one small step to help pressure Israel to end its violation of basic rights and international law,” the letter continued. 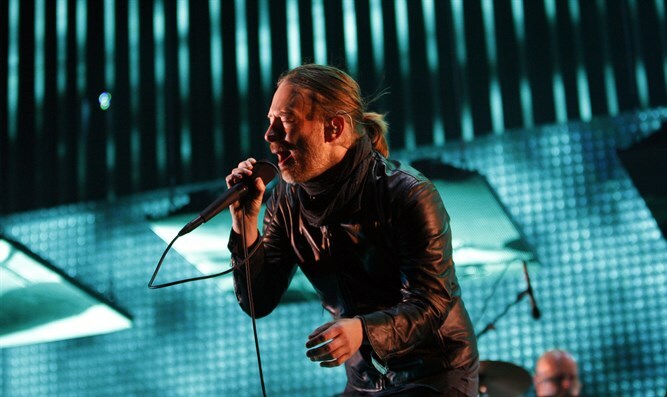 Radiohead frontman Thom Yorke on Friday responded to the campaign, saying it sowed divisions. "All of this creates divisive energy. You're not bringing people together. You're not encouraging dialogue or a sense of understanding," Yorke was quoted as having told Rolling Stone magazine. "It's such an extraordinary waste of energy. Energy that could be used in a more positive way," he added. Yorke called it "patronizing in the extreme" to presume Radiohead is unfamiliar with the Israeli-Palestinian Arab conflict, pointing out that guitarist Jonny Greenwood's wife is an Israeli Arab. "It's really upsetting that artists I respect think we are not capable of making a moral decision ourselves after all these years," he said, according to AFP. "They talk down to us and I just find it mind-boggling that they think they have the right to do that," added Yorke. Nigel Godrich, the longtime Radiohead producer often considered the band's sixth member and who produced the latest album by Waters, told Rolling Stone he disagreed with cultural boycotts but considered Waters and Yorke "two peas in a pod" in other respects. Waters admitted in late April that his push to get Radiohead to cancel the Israel concert had failed. He previously released a giant balloon pig bearing the Star of David during a concert in Belgium. Concert-goers said the Jewish star was among several symbols representing various corporations and fascist movements. Among the artists and actors he has pressured to boycott Israel are The Chemical Brothers, Jon Bon Jovi, Alan Parsons, the Rolling Stones, Neil Young and Scarlett Johansson.